Diversity Consultant | Jones Diversity, Inc.
Sharon E. Jones is a lawyer by training and a diversity consultant who specializes in working with and training individuals, law firms, corporations, nonprofits, educational institutions, and other types of organizations. She is a graduate of Harvard Law School and Harvard College and the founder and CEO of Jones Diversity. From 1985 to 1989, Ms. Jones served as an Assistant United States Attorney for the Northern District of Illinois, based in Chicago, where she conducted federal grand jury investigations and trials in high-profile white-collar criminal cases. In private law practice, she was a partner at Bird, Marella, Boxer, Wolpert & Matz in Los Angeles. In addition to her litigation practice, she was responsible for all in-house continuing legal education, as well as advising clients on a variety of employment and workplace harassment issues. Ms. Jones was Of Counsel at Orrick Herrington & Sutcliffe in Los Angeles, where she created and implemented its litigation training as well as firm-wide orientation training and evaluation programs. She has taught trial advocacy, both as an adjunct professor at Northwestern Law School and at the National Institute for Trial Advocacy. In the corporate sector, Ms. Jones managed litigation matters worldwide for Abbott Laboratories, advised senior leadership in matters of crisis management, and fashioned creative solutions to highly complex business issues. After leaving Abbott Laboratories, Ms. Jones acted as Senior Counsel at SBC Communications (now AT&T). From 2000 to 2001, Ms. Jones served as Vice-Chair of the American Bar Association Private Antitrust Litigation Committee, and, from 1994 to1995, she was Vice-Chair of the American Bar Association West Coast Committee of White Collar Crimes. She is a co-author of two Bar Association reports, providing consulting advice to Los Angeles County: "The City in Crisis-A Report by the Special Advisor to the Board of Police Commissioners on the Civil Disorder in Los Angeles" (October 1992) and "Report of the Los Angeles County Bar Association Advisory Committee for the Office of the District Attorney" (September 1994). Ms. Jones is also the author of "Structural Equity - Key Components for a Successful Inclusion Initiative" (April 2018) published in The Diversity Agenda by Ark Group. Ms. Jones served as Counsel of Record in the amicus curiae briefs of two cases filed in the United States Supreme Court by the Black Women Lawyers Association of Chicago. In Grutter v. Bollinger and the University of Michigan (2003) she supported diversity in higher education; in Parents Involved in Community Schools v. Seattle School District (2006), she supported the right to voluntarily desegregate public schools. Ms. Jones is past president and co-founder of the Black Women Lawyers Association of Chicago (1986), an organization that continues to thrive today. Previously, she served as the program chair and created the innovative monthly BWLA Roundtable luncheon series, designed to increase mentoring and networking opportunities for its members. 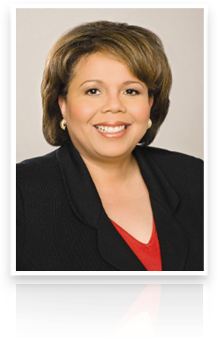 She has served as a consultant to the ABA General Counsel Steering Committee to the Minority Counsel Program. Ms. Jones is the past chair of the Chicago Bar Association Committee on Racial & Ethnic Diversity and was instrumental in the 2006 adoption of the Chicago Bar Association's Diversity Initiative and Commitments on Racial & Ethnic Diversity. She is the past president of the Harvard Law School Alumni Association and former member of the Board of Directors of Women Employed. Ms. Jones is currently an elected director of the Harvard Alumni Association and serves on the Board of Directors for the National Association of Women Lawyers and the Federal Defender Program of Illinois. Ms. Jones is particularly passionate about diversity and inclusion in education at all levels. She is co-founder of the Association of Black Radcliffe Women. Ms. Jones is a former board member of Just the Beginning Foundation, a pipeline organization focused on inspiring middle and high school students of color and increasing diversity in the legal profession. She has conducted many diversity education trainings and unconscious bias trainings for various clients. More recently, Ms. Jones created the Burgard High School Advanced Manufacturing Program for NY Empire State Development in Buffalo, NY, a collaboration with Alfred State College to provide college credits in advanced manufacturing to Burgard High School students. Ms. Jones has received numerous awards, including the Black Women Lawyers Association of Chicago's Woman of Vision Award (2006); Chicago Bar Association's Breaking Barriers, Building Bridges Award (2008); National Law Journal, Two Steps Forward Leading Women in Law Award; U.S. Department of Housing and Development Commendation; U.S. Department of Justice Outstanding Achievement Award; and the Young Women's Leadership Charter School's Industry Leader Award (2008).